Join the Bulatlat.com mailing list! It's a classic case of developers clashing with environmentalists, historians and archaelogists who are intent on preserving the country's cultural heritage. In Cagayan de Oro City, the mayor says historical landmarks should sacrifice in favor of infrastructure development. Some Cagayanons think otherwise and they're asking officials of the National Museum and the National Historical Commission to intervene. CAGAYAN DE ORO CITY - Environmentalists and residents of Quezon City are not alone in opposing MMDA chair Bayani Fernando's move to remove trees that he says obstruct traffic. In Cagayan de Oro City in southern Philippines, a project that city officials say is designed to ease traffic congestion is making local historians, anthropologists and environmentalists furious. As far as Cagayan de Oro Mayor Vicente Emano is concerned, however, nobody can stop his government from constructing the road - set to be inaugurated this August. He insists that people prefer "development" over the preservation of historical heritage. The road and bridge construction has bulldozed parts of a historical site that dates back to 377 AD or even earlier and those opposed to the project say the construction not only desecrates the country's historical heritage but is also illegal. Officials of the National Museum in Manila have also been asked to intervene. The area in contention is the famous Huluga Site in sitio (sub-village) Taguanao, Barangay (village) Indahag in this city. A private contractor commissioned by city hall, UKC Builders, is building the P500-million road leading to a bridge that will connect Taguanao to Barangay Balulang. One of those opposed to the project, Erlinda Burton, accused UKC of destroying significant parts of Huluga. Burton, Ph.D. and director of Xavier University's Research Institute for Mindanao Culture (Rimcu), said the desecration means a loss of part of the country's heritage and could hurt tourism. "It (the site) is invaluable," she said, as she lashed out at city hall for sacrificing Cagayan de Oro's heritage for infrastructure development. She also said she and her group felt betrayed by Mayor Emano who had assured them that UKC would build the road 2,000 meters away from Huluga. "Walang pakialam (it's indifferent) - the local government is not interested in preserving heritage,'' Burton added. Antonio Montalvan II, formerly of city hall's Cultural and Historical Commission, also criticized the mayor for what has happened to the Huluga site. "It's very frustrating... It's very difficult to work with Emano,'' Montalvan said. Years ago, he left the commission over what he said is the mayor's lack of concern for the city's heritage. Montalvan, who has formed a group called Heritage Conservation Advocates (HCA) that is keeping watch on the Taguanao-Balulang road and bridge project, also hurled brick-bats at Emano for not consulting archaeological experts before construction began. In a recent paper, Montalvan said the worst pummeling being done by the road builder is on the Huluga "open site" which, he warned, continued to yield archaeological artifacts. He cited a National Museum recommendation that the entire Huluga should be off-limits to any engineering project because underneath it could be valuable relics and other evidences of prehistoric or ancient Cagayan culture. Indeed, the Huluga site has yielded proofs that pre-historic Cagayanons were most likely engaged in trading around 377 AD or even during the late Neolithic period. 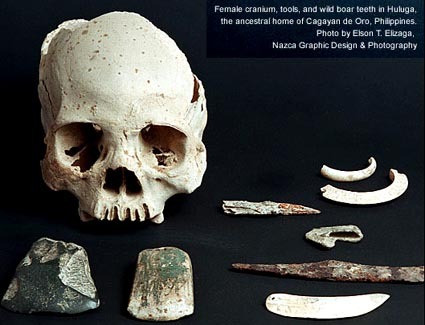 In the early 1970s, skeletal remains were found in one of the two Huluga caves along with shards of pottery. Experts said these had either been buried along with the dead or used as burial jars. Glass beads, a native spoon, a pendant, a bracelet, stone tools, an ax tip and pieces of iron were also unearthed inside the cave. Dug up in the cave adjacent to the first were also ancient metal tools and household utensils suggesting, according to the late Jesuit priest and historian Francisco Demetrio, that it "might have been a habitation site, and that the people buried their dead next door." Experts from the National Museum were reportedly convinced that the caves were used by early Cagayanons from the late Neolithic to the Iron Age. The first cave also yielded skeletal remains believed to be that of an aborigine who lived in Cagayan de Oro around 377 AD, an information confirmed in an earlier interview with Dr. Burton. A skull found along with the skeletal remains, said museum anthropologist Jesus Peralta, belonged to a woman in her early '30s. The skull has since been kept inside the Museo de Oro at Xavier University. The "open site" where a road is being built by UKC has been yielding fragments of pottery and obsidian flakes on the surface - proof that "man is ancient in Cagayan de Oro." The obsidian flakes - considered one of its kind in the country - are believed to have come from weapons or stone tools used by early Cagayanons who lived during the late Neolithic period. That the obsidian flakes were found to be of foreign origin bolstered the hypothesis of social scientists that Cagayan de Oro's early settlers were not barbaric because they, obviously, were into trading. The "open site" is located some seven feet above the river and directly north of the hill on the higher elevation and the caves. The damage caused by the ongoing construction is irreparable, local experts said. "There is nothing we can do now," said Burton who led a team of local experts to assess the damages last June 23. Just the same, Burton and Montalvan said city hall can be held liable for violating a law that bans construction work or any activity that destroys historical and archaeological landmarks such as Huluga. But the road contractor is undaunted by accusations that a crime has been committed. Johnny Uy, UKC Builders chief executive officer, said his company merely followed city hall's plan. "We (UKC) cannot just work on the project without looking at the program of work because some of the areas there are owned by private individuals. We don't want to be boloed by the private land owners," said Uy. Uy said the city engineer's office has been supervising the construction of the road and bridge. "We're just the contractor," he said. "Before we bulldoze, we ask the city engineer's office. We just follow instructions." Jorie Bingona, city engineer, also insisted that the caves were left untouched. The caves, however, are only part of the entire Huluga archaeological site while bulldozing was done on the "open site," near the caves, where an ancient village is believed to have existed. Mayor Emano maintained that city hall did the right thing in flattening out portions of the archaeological site. "Para nako, mas importante man unta ang tulay kay mao man g'yud ni ang mapuslan sa katawhan" (As far as I'm concerned, the bridge is more important because people will find it useful),said Emano. "Pasaylu-on lang ako nila. Alang kanako mas bililhon kaayo ang tulay kay sa gi-ingon nila nga heritage nga na-damage"(I hope they forgive me. But for me, the bridge is more important than heritage). We want to know what you think of this article.